I guess I can start at the begining. I was born in Chilliwak, British Columbia, Canada, and I was raised in Swift Current Saskatchewan. I have my youth care worker certificate, and my general Biblical Studies certificate. I love working with kids, so haven writen a young reader book kind of suits me as it gives me a chance to interact with kids. I have been happily married for two years as of May 12(I know I am only 21 but I am proud to be happily married to my high school sweetheart.) I love reading, and have been reading novels since as far back as I can remember, being a published writer is a dream come true and I hope to make a full time career out of it. When did u start writing? I think I started writing when I was eight or nine, I am not sure which. When I leanred how to write stories I was hooked, I couldnt stop writing. Looking back they seem really lame, almost funny, but hey we all have to start somewhere right? I started taking writing as a serious career when I took Creative Writing in high school, and I havent stopped pushing onward since. Who would you consider your writing mentor? My favorite author was definitley Louis L'Amour. His westerns helped give me the desire to read more, to engrose myself of moments of the past. His work gave the ambition to stive to improve my writing, even now I am still learning how to write, and I hope that I never feel I have learned everything there is to know about this amazing craft. What inspired you to write Kids on a Case? my inspiration...good question, I guess that I remembered reading a lot of a mystery books growing up that dealt with really childish mysteries and I always wanted to find a mystery writer who wrote more adult situation mysteries for kids. When I couldnt find any(with the exception of the Hardy boys series) I decided to create one myself, and so began the creation of characters, setting, and plot(all before I thought of writing as a career choice.) The characters in my book come from a combination of my school friends. None of the characters are created from one person. They are all little pieces of peoples characters. 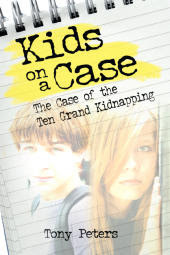 Why did you choose kidnapping as a topic for Kids on a Case? I figured that kidnapping was a good adult topic that wouldnt cross lines with gruesomeness. Also ever mystery writer does a murder, to write another one would be over-killing an already over killed topic. Dont get me wrong, i love a good murder mystery, its just overdone is all. A kidnapping would also allow the group more leverage to find their own clues. In a murder the police would guard the crime scene too heavily. What other books are you currently working on? I am currently in the process of editing a sequal, called Kids on a case: Hunting Black Dragon(that is the planned title, but it could change.) It will be longer, and the language difficulty steps up just a little. I think that it is better written than the last one, and it doesnt include the annoying repeat page(yes i too find that annoying, and if I could go back I would find a way to avoid it.) This one involves more danger and intrigue. Favorite author... growing up it was the two afore mentioned authors, but now I would have to say J.R.R. Tolkien and C.S. Lewis, which is kind of funny because they used to be friends. They use imagery so well and are very creative. I respect them greatly. Favorite food would have to be Lasagna and Ceasar salad. Favorite care is the Viper or maybe even the Porsche Carrera G.T. School ends in one week, and all I have to do is take final exams for all of my classes, do three more projects, do all my drivers ed work and find a way to have fun/survive the next week. After School is finally over I plan on having my first author interview, reviews on Waiting for you, When it happens, and Perfect Chemistry. I cant wait for this summer I hopefully will do all that i plan to do, go to the beach and to survive the heat thats coming. So on shelfari.com there was a member in the same group as me who was asking for reviewers to help with her website, I replied and said yes. So she would send me short stories I read them and post them. After June 7th when school and drivers ed is FINALLY over expect more reviews from me that are not just short stories. In total for this year so far Ive read 33 books and I would love to read 100 or more, Just 67 more books to read. Anyone have any suggestions on what to read?